Faustina Akyoo, a small-scale dairy farmer in Tanga, Tanzania (photo credit: ILRI/Paul Karaimu). Smallholder farmers in Tanzania are straining to keep up with a fast-moving dairy industry to avoid being marginalized by changes in competition patterns, consumer preferences and markets requirements. 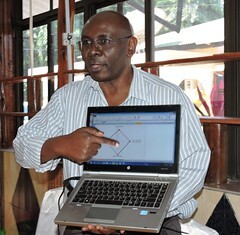 In 2014, Roselynne Muchichu completed a master’s thesis looking at the ‘sustainability of dairy development in Tanzania: adoption of a participatory market chain approach system.’ It looked at factors that would facilitate or impede adoption of the dairy hub model by farmers, input providers and milk traders and recommended interventions to ensure increased participation by small-scale actors in the dairy value chain. The Tanzania government, in partnership with the Irish government-funded ‘MoreMilkIT’ dairy development program, is aiming to implement dairy market hubs in the country to increase milk production to meet an increasing demand. 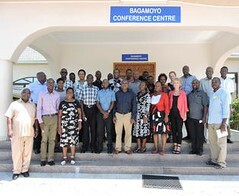 The program brings together Sokoine University of Agriculture, Faida Mali, Tanzania Livestock Research Institute (TALIRI), Heifer International, Tanzania Dairy Board, the International Livestock Research Institute (ILRI) and other partners. By targeting rural producers who predominantly sell milk to rural consumers and commercial rural producers who sell milk to urban consumers, the project will set up dairy hubs in Kilosa, Mvomero, Handeni and Lushoto districts to improve informal markets and market actors’ capacity to upgrade value chains contributing to higher quality and safer dairy products for consumers. Muchichu’s study evaluated factors influencing adoption of the dairy hub model by assessing patterns of its use by dairy chain actors in Tanzania. Ninety-six participants (65 input providers and 31 traders) from the three districts took part in the study, which analysed the adoption, construct measures, attitudes and opinions of respondents. She found that market dynamics are key in influencing adoption of dairy hubs. Value chain actors are more likely to favour dairy hubs if these help resolve problems of access to markets, address storage and transport challenges and increase access to credit for producers. Traders are motivated by incentives such as sales volume, payment guarantee and business networks, while sales volume, payment guarantee and improved access to larger markets were found to attract input providers to the program, though there is uncertainty on whether perceived access to markets will sustain their participation in the hubs, considering increased profits may not be realized immediately. Her findings indicate that the participation of smallholder farmers in markets can contribute to higher output and income growth, which in turn can enhance food security, poverty reduction efforts and overall economic development. Business development approaches should be aimed at all value chain actors, including smallholder farmers so they are able to tackle market factors to strengthen the links in the value chain. She also recommends that engagement approaches likely to influence high participation of smallholders, input providers and the private sector be used to increase ownership in the program and ensure its sustainability. The study also calls for collective action towards liberalizing output and input markets, access to services, market information and new technologies. 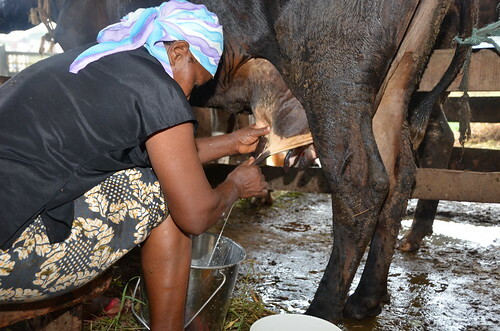 The success of the country’s dairy sector, she says, also depends on how well challenges such as poor infrastructure, overlapping government and private sector roles, land tenure and use, agricultural extension and innovation are addressed to ensure smallholders benefit. With contributions from ILRI’s Paul Karaimu.